Great coverage of betting markets. Above average odds for some markets. Good Live Betting & Streaming markets. NordicBet is part of the market leading Betsson Group. The company was founded in 2002 and was purchased ten years later by the Scandinavian group. 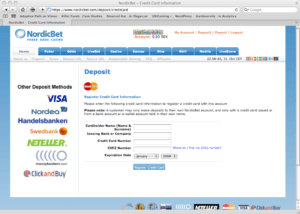 The sportsbook is licensed and regulated by the Maltese gambling commission. 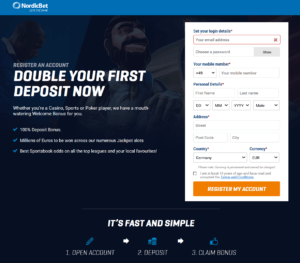 The company’s main target group is based in Scandinavia, however, the sportsbook has recently opened its doors for customers from many other countries as well. Due to their close ties with the Betsson Group, your funds will be safe and payments are always processed really quickly. New NordicBet customers can enjoy a great welcome offer. 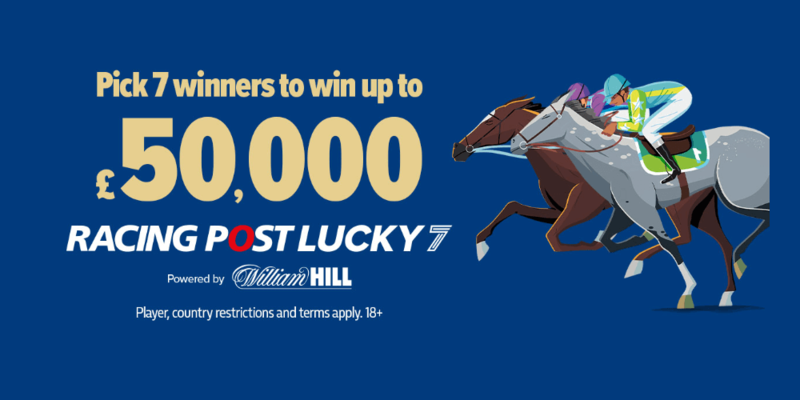 By signing up with us, you will get a €10 Free Bet when you make a deposit of €10 or more and then place a qualifying bet of at least €10. You can use your €10 Free Bet on any event and as a “Combi Bet” or “Live Bet”. You can also use it to place a bet with your mobile devices. Place a qualifying bet of at least €10 on the sportsbook. You will not be eligible for this welcome bonus if you place your first deposit with Neteller or Skrill. The qualifying bet and free bet can be placed as a single bet or as a combi-bet. You cannot use the free bet to place a system bet. If you don’t use your free bet within 7 days of being credited with it, it will be removed. If the free bet is a winner, you’ll need to wager through the winnings 3x at odds of 1.5 within 14 days. System bets do not contribute to the wagering requirement of the bonus. Our following step-by-step guide will show you how to easily set up your account within a few minutes and benefit from a great €10 Free Bet offer. Please make sure to use our sign-up link to start the free registration process. You will then be redirected to their homepage, where you just need to click the ‘Register’ button in the top right corner. The sportsbook offers 29 kinds of sports and many leagues to place bets on. 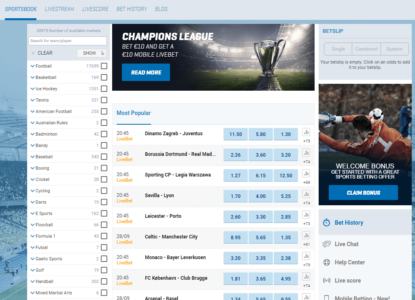 The selection of betting markets and matches covered in European soccer is fantastic and can compete with the best sportsbooks online. Moreover, you will find several other lesser known markets like politics, bandy, and eSports. 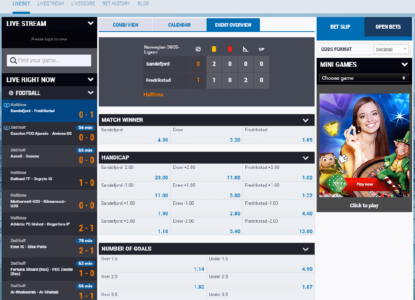 ESports fans especially should also check out our NordicBet eSports Sportsbook Review, where we have focused on all the benefits for eSports betters. NordicBet offers pretty high odds on favorites, which is good for most betters, but you will rarely find odds above average for underdogs. Their margin on football-games is 8%, which is also quite high. So, you can find some really profitable odds, but you have to take a closer look and you should definitely compare with other sportsbooks before placing your bets. Our Odds Comparison Page, where we provide an overview of the best odds for different events through different sportsbooks, is the perfect tool for that. You can easily find the most profitable sportsbook to place your bets. Give it a try and see how easy it can be to increase and maximize your winnings by just picking the best site to place your bets. 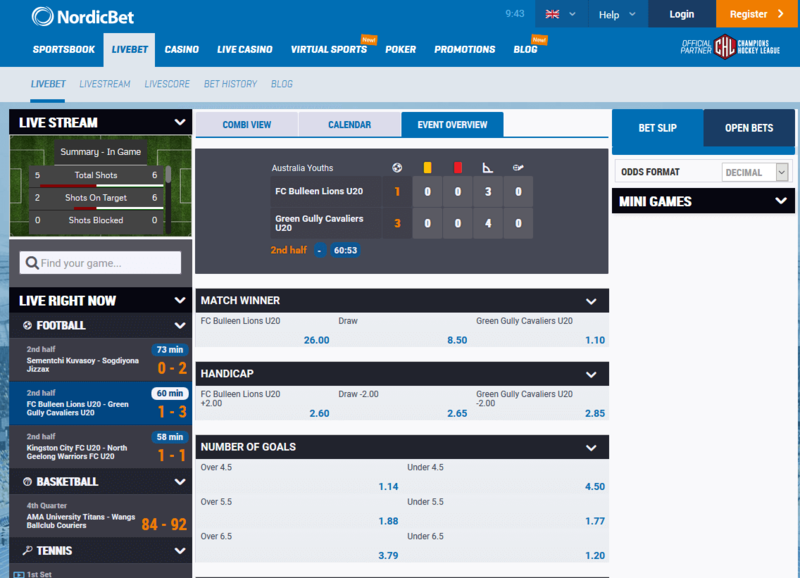 NordicBet has pretty good coverage for live betting and you will find betting markets for almost all sports. Fans of live betting will find everything they need to have a great time. Especially in combination with their perfect live streaming offers, you can bring your betting experience to a whole new level. 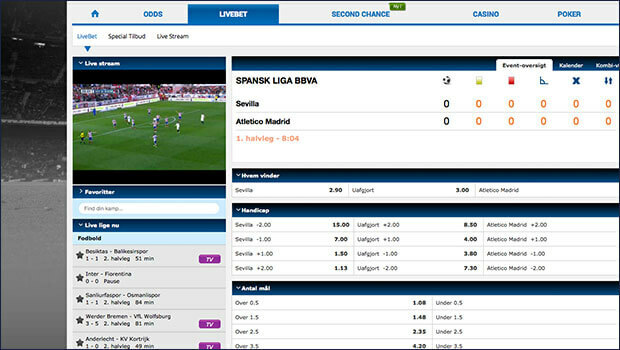 NordicBet was one of the first sportsbooks to introduce a live streaming service. Tennis fans inparticular will be delighted to discover that even challengers are available for live streaming. Players can bet in real-time and even watch most of the European football leagues and plenty of the major tennis competitions. Combined with live betting, your betting experience becomes even more exciting. Just watch your favorite teams live on the screen and instantly place some profitable live bets if the time is right. NordicBet covers the most important payment options and every better should find his preferred method to deposit and withdraw his money. The following table gives you a quick overview about the most important payment options and their fees and limits. 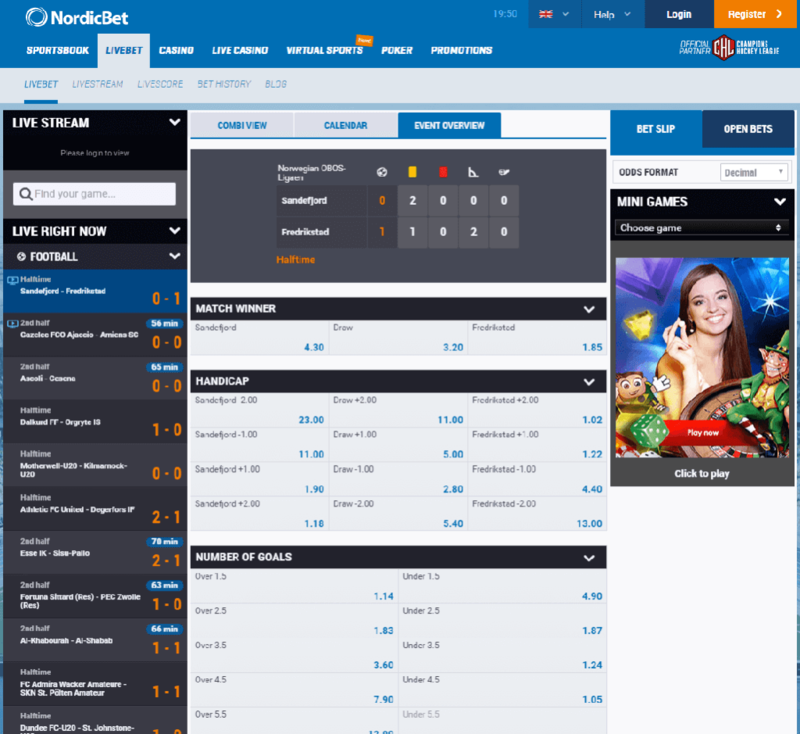 NordicBet is running great regular sportsbook promotions. You will also be offered several other exciting bonuses for the casino, poker, and virtual games as well. Make sure to check our overview regularly to not miss any additional value. 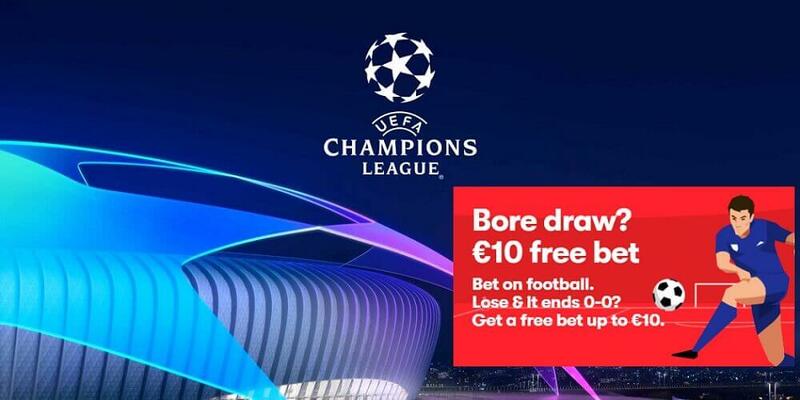 €10 Champions League Mobile Livebet – Opt-in for this promotion and place a €10 Pre-Match Bet on Champions League Games. You will receive a €10 free bet on your mobile that can be used on Champions League matches for either Tuesday or Wednesday, both pre-match and live. You can claim another free bet each Champions League week. 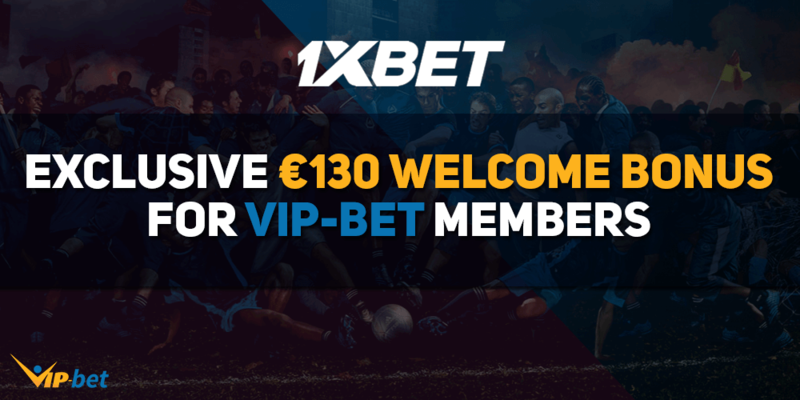 Stake €10 Get €10 – NordicBet Virtual Sports include football, tennis, basketball, horse racing, and dog racing. Choose the one you like the most and place a bet. After you have wagered €10, you will be credited a €10 bonus. This promotion is only available to customers from Norway, Sweden, and Finland. You have to wager the €10 x15 times on Virtual Sports games in order to withdraw your bonus. Get Free Bets on eSports Every Week -Opt in to the campaign. You need to have at least €5 in your account to cover the stake of the risk-free bet. Use your free bet by ticking the blue check box on your bet slip – if your bet loses, get your money back without wagering requirements. 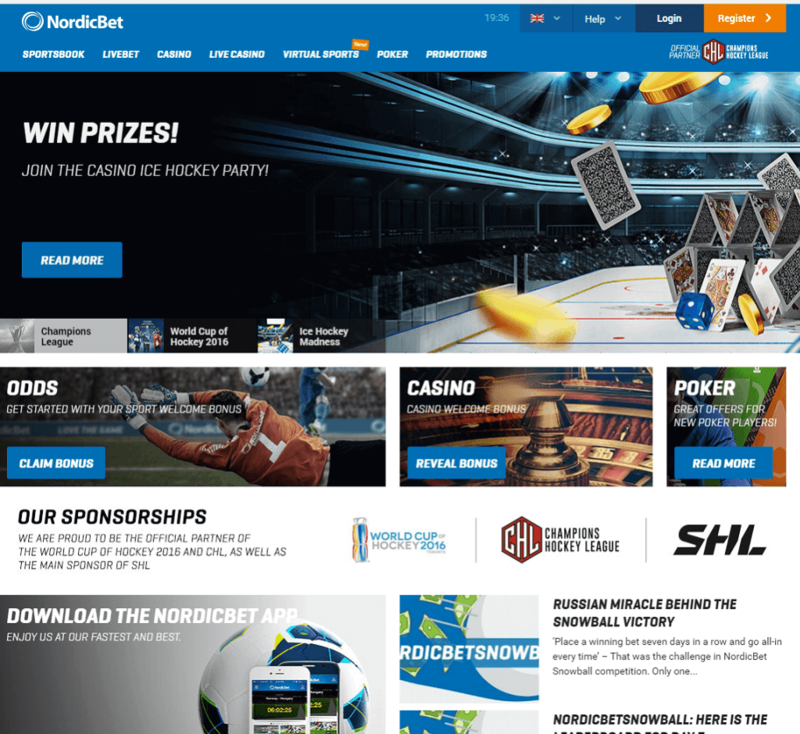 NordicBet is part of the Nordic Gaming Group LTD . The company was founded in 2002 and owns a Maltese Sports Betting License and is regulated by the Malta Gaming Authority. 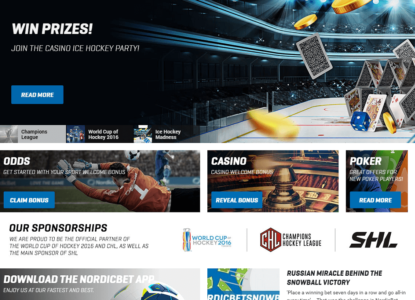 The sportsbook was established in order to offer customers from Northern Europe odds for Nordic sports. The company continues to put a strong focus on these sports. They offer a great number of sports and events and decently priced odds. Recently they have also updated their website and added several amazing live streams, which allows you to enjoy you the thrill of amazing live matches in the most popular sports. 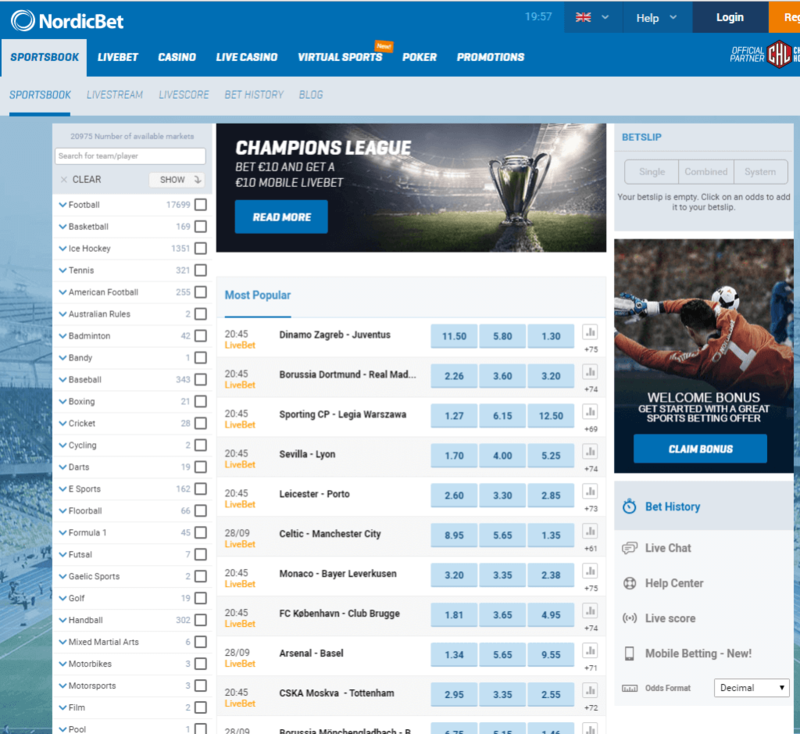 In the early 2000’s there was no sportsbook to place bets on Nordic sports – this is why NordicBet was created. The company was targeting the Northern European markets since its start, with key markets being located in Finland, Sweden, Norway, and Denmark. 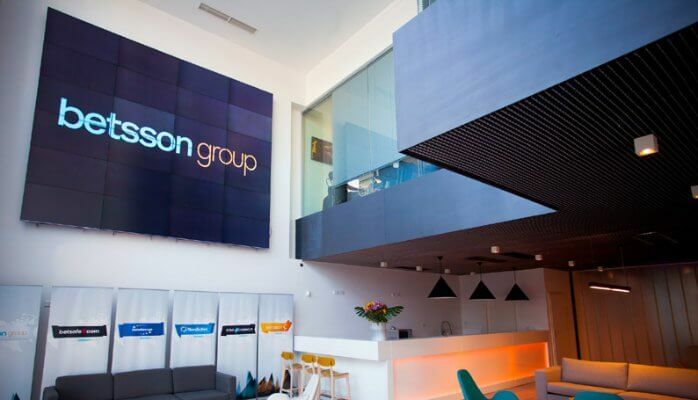 In 2012 the company was acquired by the Betsson Group for nearly €85,000,000. By that time, the company had already established a large market share in its main markets and also managed to establish itself as one of the leading sports betting and online gaming companies in Scandinavia. 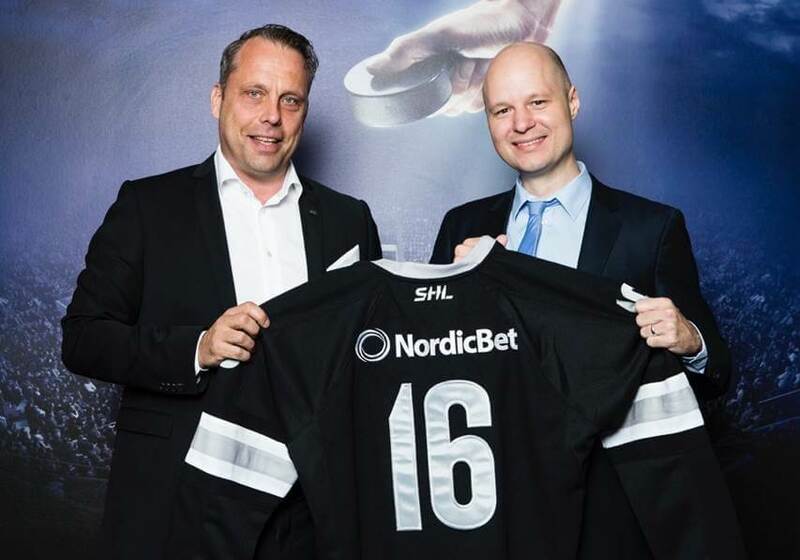 The company became the sponsor of the Champions Hockey League in its debut season in 2014/15. Following the acquisition by Betsson, the company started expanding their live betting area and also added several high quality live streams to their website. Customers can watch games from the Italian Serie A, French Ligue 1, NBA, or the Russian KHL. Nowadays, they are offering more games and markets than ever before. The Scandinavian sportsbook has also begun to accept customers from more and more countries. From 2015 they started allowing players from the Czech Republic, Germany, and Switzerland to sign up for an account at their site. It is to be expected that NordicBet is going to be accepting customers from even more countries in the near future. Head Office: Union Square, Malta. NordicBet brings you an easy to use app for iPhone and Android to enjoy your favorite sports betting event on the go whenever and wherever you want. Get in on the live action and bet on your favorite team. You can also follow your matches and odds through live stream in real time and easily handle your deposits and withdrawals with your mobile device. You can use the mobile app for all your Android and iOS devices. The iOS app can be downloaded from the Apple Play Store. However, it is a bit more complicated with the Android app. The reason for that is Google’s strict policy against gambling and therefore they removed the apps from their store. However, most bigger sites are fully aware of this problem and provide a link to download the app on their sites and so does NordicBet. To download the Android app just click the following button and follow the instructions on the NordicBet Mobile website. Please note, you will also find several other sources where you can download the android app, but we would highly recommend to not use apps from an unknown source and only use the app from the original app from their homepage. Live Streaming: Nordicbet is offering live streaming coverage for football, ice hockey, tennis and basketball. Sports & Leagues: American football, bandy, baseball, basketball, boxing, cycling, golf, handball, ice hockey, martial arts, motor racing, poker, rugby, snooker, soccer, tennis, trotting, water polo. NordicBet is available worldwide, but there are still a few regions where customers are not allowed to open an account. Check the following overview to see all regions where you are not allowed (orange) to open a NordicBet account.